In this series of experiments… a wide variety of objects of various sizes, shapes, weights, and configurations were used to spatter far more blood than was spattered in the commission of the Marilyn Sheppard murder. 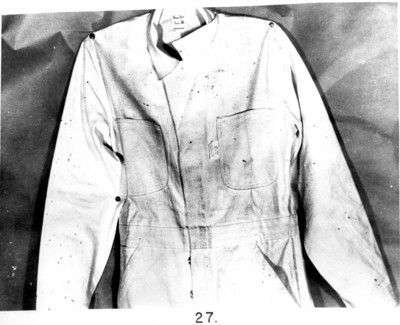 During the entire series of experiments, the same set of coveralls was worn without washing or disturbing any of the deposited blood on that garment. The appearance of the garment is shown in photographs No. 27, 28, and 29. The amount of blood that was spattered backward was uniformly less than that spattered sidewise or forward, even though the blows were delivered in a number of ways and under all the variations listed above. While the amount of blood is definitely significant, it shows that the murderer could have escaped without having accumulated enough blood to drip or leave any blood trail whatever from that source.